Route 66 had its official beginnings in 1926 when the Bureau of Public Roads launched the nation’s first Federal highway system. Like other highways in the system, the path of Route 66 was a cobbling together of existing local, State, and national road networks. Extending 2,400 miles from Chicago to Los Angeles, the new highway wound through eight States and was not completely paved until 12 years after its designation. Many of the merchants in the small and large towns through which the highway passed looked to the road as an economic opportunity to bring much needed outside revenues into their often rural and isolated communities. Actively promoted in its early years, the highway quickly became a popular transcontinental route, because it offered a route with better weather than alternative east-west roadways. As the highway became busier with the nation’s traffic, the roadbed received marked improvements, and the infrastructure of support businesses, especially fuel, lodging, and food, lining its right-of-way expanded dramatically. Spawned by the demands of a rapidly changing America, Route 66 did not follow a traditionally linear course in contrast to the Lincoln, the Dixie, and other highways of its day. Its diagonal route linked hundreds of predominantly rural communities in Illinois, Missouri, and Kansas to Chicago, thus enabling farmers to transport grain and produce for redistribution. This diagonal configuration was particularly significant to the trucking industry, which by 1930 rivaled the railroad for preeminence in the American shipping industry. In addition to its abbreviated route between Chicago and the Pacific coast, Route 66 traversed essentially flat prairie lands and enjoyed a more temperate climate than that of northern highways, further enhancing its appeal to truckers. The Illinois Motor Vehicles Division reported that between Chicago and St. Louis trucks increased from approximately 1,500 per day in 1931 to 7,500 trucks a day a decade later. Twenty-five percent of these were large tractor-truck, semi-trailer outfits. Highway designers intended to make Route 66 "modern" in every sense of the term. State engineers worked to reduce the number of curves, widen lanes, and ensure all-weather capability. Until 1933, the responsibility for improving existing highways fell almost exclusively to individual States. The more assertive and financially prepared States met the challenge. Initial improvements cost State agencies an estimated $22,000 per mile. In 1929, Illinois boasted approximately 7,500 miles of paved roads, its entire portion of U.S. Highway 66. 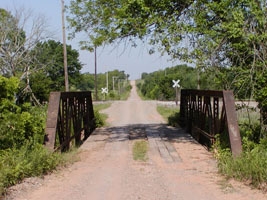 A Texaco Gasoline road report published that same year noted the route as entirely concrete in Kansas, 66% paved in Missouri, and 25% improved in Oklahoma. In contrast, the 1,200-mile western stretch had not seen a cement mixer, with the exception of California's metropolitan areas. Until the height of the Great Depression, Texas, New Mexico, Arizona, and the desert communities of southeast California had a collective total of only 64.1 miles of surfaced highway along Route 66. Washington's increased level of commitment began with the Great Depression and the national appeal for emergency Federal relief measures. In his famous social commentary, The Grapes of Wrath, John Steinbeck proclaimed U.S. Highway 66 the "Mother Road." Steinbeck's classic 1939 novel and the 1940 film re-creation of the epic odyssey immortalized Route 66 in the American consciousness. An estimated 210,000 people migrated to California to escape the despair of the Dust Bowl. In the minds of those who endured that particularly painful experience and in the view of generations of children to whom they recounted their story, Route 66 symbolized the "road to opportunity." Re-examining the Great Depression years, contemporary writers found that thousands of disillusioned immigrants returned home within months after reaching the Golden State. Of the more than 200,000 refugees who journeyed west to California beginning in the early 1930s, less than 16,000 people from the Dust Bowl proper ended up in California. Despite popular perceptions promoted in Steinbeck's novel, James Gregory argues convincingly that barely 8% of the "Dust Bowlers" who set out for California remained there. California's total demographic growth between 1930 and 1940 reflected scarcely more than a 22% increase, compared to a 53% growth rate in the following decade. The importance of Route 66 to emigrating "Dust Bowlers" during the Depression years received wide publicity. Less is known about the importance of the highway to those who opted to eke out a living in economically devastated Kansas, Oklahoma, West Texas, and New Mexico. During this time, U.S. Highway 66 and other major roads in America had integral links to President Roosevelt's revolutionary New Deal programs for work relief and economic recovery. Road improvements and maintenance work were central features of the New Deal's Civilian Conservation Corps (CCC) and Works Project Administration (WPA) programs. From 1933 to 1938, thousands of unemployed male youths from virtually every State were put to work as laborers on road gangs. Because of this monolithic effort, the entire highway from Chicago to Los Angeles had pavement by 1938. In Gregory’s final analysis, Route 66 affected more Americans on Federal work relief than people who used it during the famous exodus to California. 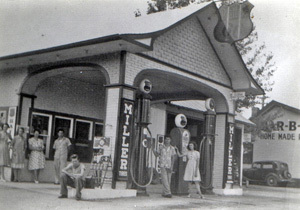 As the Depression worked its baleful effects on the nation, it also produced an ironic consequence along Route 66; the vast migration of destitute people fleeing from the privation of their former homes actually produced an increased volume of business along the highway, thus providing commercial opportunities for a multitude of low-capital, mom-and-pop businesses. The buildings constructed for these businesses reflected the independence of the operations, a general absence of standardization, and a decentralized economic structure. At the same time, it became clear that life along Highway 66 presented opportunities not available to the nearby towns and businesses that lost traffic to the important highway and who suffered accordingly. At a very early point it was evident that a major nearby highway could both bring business and take it away. 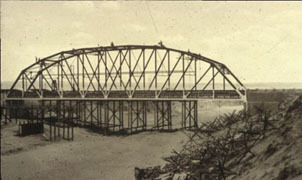 Completion of the all-weather capability of Route 66 on the eve of World War II was particularly significant to the nation's war effort. The experience of a young Army captain, Dwight D. Eisenhower, who found his command bogged down in spring mud near Fort Riley, Kansas while on a coast-to-coast maneuver, left an indelible impression. The War Department needed improved highways for rapid mobilization during wartime and for national defense during peacetime. At the outset of American involvement in World War II, the War Department singled out the West as ideal for military training bases, in part because of its geographic isolation and especially because it offered consistently dry weather for air and field maneuvers. The department invested over $230 million in new military bases in Arizona alone. Several military installations, including Fort Leonard Wood in Missouri, Fort Wingate Ordnance Depot in New Mexico, Navajo Ordnance Depot in Arizona, and Edwards Air Force Base in California, were established on or near Route 66. America's mobilization for war after Pearl Harbor underscored the necessity for a systematic network of roads and highways. The War Department's expropriation of the nation's railways left a transportation vacuum in the West that only the trucking industry could fill. Automobile manufacturers suffered critical shortages of steel, glass, and rubber during the war years, and plants in Detroit converted to the production of tanks, aircraft engines, ordnance, and troop transports. According to one government source, the production of new cars dropped from 3.7 million in 1941 to 610 in 1943, because of rationing. At the same time, production of trucks capable of hauling loads in excess of 30,000 pounds increased to keep pace with wartime demands. Studies by the Public Roads Administration between 1941 and 1943 showed that trucks rather than trains transported and delivered at least 50% of all defense-related material destined for America's war production plants. Because Route 66 was the shortest corridor between the west coast and the industrial heartland beyond Chicago, mile-long convoys commonly moved troops and supplies from one military reservation to another along the highway. Route 66 helped to facilitate the single greatest wartime mobilization of labor in the history of the nation. Between 1941 and 1945, the government invested approximately $70 billion in capital projects throughout California, many in the Los Angeles-San Diego area. This enormous capital outlay underwrote entirely new industries that created thousands of civilian jobs. By 1942, with the exhaustion of available local labor in most areas on the Pacific Coast, war contractors began a frantic search for skilled and unskilled workers from across the United States. Under the provisions of the West Coast Manpower Plan initiated in September 1943, contractors prepared to offer jobs to 500,000 men and women to meet the production demands of global war. In February 1942, Public Roads Administration Commissioner Thomas MacDonald announced that existing rail and bus transit facilities could accommodate only a small fraction of the 10 million workers required to operate the defense plants. The rest would have to move in private automobiles. They moved in unprecedented numbers. The net result of this mass migration was the loss of more than 1 million people from the metropolitan northeast between 1940 and 1943. Three Pacific Coast States--California, Oregon, and Washington--increased 38.9% in population (measured against a national average of 8.7%). Route 66 played a critical role in this vast movement of Americans to meet the demands of war.